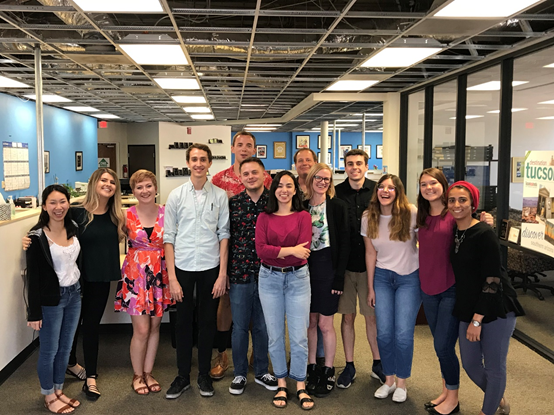 This summer I had a blast interning at The Northwest Explorer office which hosts the Tucson Local Media in Tucson, Arizona. Tucson Local Media is home to weekly newspapers that cover the areas of Oro Valley and Marana as well as other neighboring communities in Tucson. My first day was full of orientations learning new information, and introductions. Interns were introduced to the staff at the office, and each mentor introduced themselves. We started off with one-on-one discussions with our mentors. I spent the day walking around the office asking who needed help with copy-editing. Luckily, reporters were keen on sharing their work with me and guided me through editing with AP style essentials by looking through sections of the newspapers that day. The first week started off smoothly with my first assignment, and as the ten weeks went by, I came to realize the joy that comes with the responsibility of working as a news reporter. Interns and mentors of The Northwest Explorer pose for a group photo on our last day. I eagerly jumped at every opportunity and signed up to practice my skills and increase my knowledge about journalism. Overall, I was able to keep my mind off the hot summer weather, by focusing on meeting deadlines and working with my sources to return calls and emails to get answers to my questions. During the summer people go on vacations elsewhere so it was challenging to work on certain stories since many relevant sources were unavailable. I came to learn the importance of quick-wittedness and creativity, thinking about ways to get the necessary story. No matter what the situation was, I was committed to meeting my deadlines and delivering my stories. 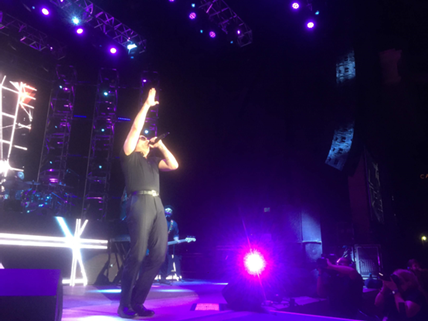 One of the blogs I wrote was a preview show for the Pitbull concert and I was able to kill two birds with one stone. I wrote the news piece and enjoyed the concert with an official press pass. I enjoyed working on my articles as they exposed me to a broad range of experiences and people in Arizona who I never would have met otherwise. It was important for me to see life in Tucson through the eyes of many different groups of people I had a great time working on my stories as I commuted using public transportation. What started as a one time instance, later became an occasional habit when running against deadlines. Otherwise, I would read a book, listen to some music, or engage in conversations with different drivers. Apart from working on my articles, I had a great time working with my mentor and supervisor, who is also the Managing Editor at Tucson Local Media. I’m lucky I had the chance to work with Logan. He was supportive, he listened to my ideas and helped keep me on track with the work. I couldn’t have asked for a better mentor than him. As an international Fulbright scholar, this internship helped me learn more about what interests and occupies the people of Tucson. Every story was an opportunity for me to understand more deeply what people care about, work on, and wish for. I explored how people beat the heat, highlighted local businesses, summer camps, and organizations embarking on new programs. I also wrote daily blogs about entertainment in the city, articles about political events, and the homelessness population. Every story was a whole different experience! Through reporting, I was able to connect and establish rapport with local residents. As an international scholar, this broadened my horizons and allowed me to realize how similar we all are as humans. The differences between us, such as our nationalities, become less important when compared with our similarities. People in Tucson were as eager to get to know me as I was to learn about them. They wanted to learn about my Fulbright scholarship, what I was studying, and what I was doing in Tucson. I know I wouldn’t have had this privilege without Fulbright. This wasn’t just about me learning new skills and growing my resume. Rather it was about giving a voice to the people of Tucson through local journalism. I wouldn’t have come this far in life without Fulbright, and I am thankful I have had the honor of representing scholars, journalists, and the people of the West Bank to Tucsonans. Dalal is a second-year Fulbright student studying Journalism at the University of Arizona. She is from the Palestinian Territories.